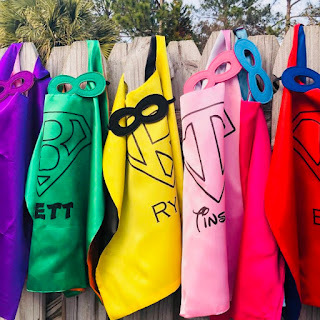 Loving these Custom Superhero Cape + Mask ONLY $13.99 (Retail $27.99). Our superhero capes are made from durable double sided satin and have a velcro fastening on the collar, coordinating double-sided mask is included. $3.99 for the first item and $2.99 for each additional item. US only. Ships no later than Wed, Apr 4.